Not every puppy is perfect for every person, and the Pound Puppies are dedicated to making sure their furry friends end up in the right hands! Join Lucky, Cookie, Niblet, Strudel and Squirt as they continue on their mission to find a person for every pup with the release of Pound Puppies: A Perfect Match on DVD. Featuring five fun-filled adventures. My kids absolutely love the show, Pound Puppies. They're still shocked that this is a remake of a cartoon that was out when I was younger. They always ask me if so and so were in the original series. It's cute to see how interested they are in both the new and original series. A Perfect Match not only is a great reminder for not just kids, but people in general to learn that not every dog is right for a person. They have to fit into your family just right and with A Perfect match the Pound Puppies are trying their best to help puppies get the perfect match for them. We just recently got a new pup in our family a couple of weeks ago. His name is Max, he's a Blue Heeler (Australian Cattle Dog) and I have to say, he definitely fits perfect in our family. He's silly and goofy just like the rest of us and I loved hearing my son make the connection from watching this DVD and the new addition to our family. You can now get Pound Puppies: A Perfect Match on DVD for $9.99 by visiting ShoutFactory. Disclosure: All opinions are my own. 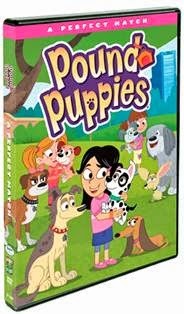 I received Pound Puppies: A Perfect Match on DVD at no cost for the purpose of this review. No other compensation was received.